His public interest work, which he undertook on his blog several years ago, largely focuses on issues of transparency, corruption, and shareholder rights. (Navalny got his start as a muckraking blogger by purchasing a small number of shares in several state-owned enterprises to get an insider's view of how they operate and by exposing the fraud he discovered.) Early this year Navalny launched a new site, RosPil, designed to harness the power of the web and his devoted readers. It relies on simple crowd sourcing methods whereby registered users and a group of experts review public documents for wrongdoing and post their findings. Anyone can submit a government request for tender (a bid for services) to the site and, if it looks dubious enough, it is promoted to the main page. This has become far easier for the average citizen to do under President Medvedev who, two years ago, announced that all government requests for tender would be posted online. Once the documents have been published on RosPil, registered members evaluate the complaint and decide whether it should be pursued. If they vote yes, Navalny showcases the alleged fraud on his blog. Two remarkable things have happened since Navalny started RosPil: after an appeal for contributions to the site in February this year, Navalny raised more than $120,000 in a week, highly unusual in Russia for a journalism website (it broke fundraising records according toYandex, Russia's leading search engine); more remarkably yet, according to the site, RosPil has caused the annulment of about $12 million in requests for tender, as well as the resignations and public shaming of several government officials. Revelations range from the absurd (the Interior Ministry ordering a gilded bed for its suburban residence) to far more serious allegations of fraud and embezzlement. Navalny's work is actually having an impact. When I traveled to Moscow two years ago to write about the state of investigative reporting there, the most common complaint I heard was that it didn't matter what newspapers published. Even if they had photos showing Putin handing over suitcases of money to corrupt businessmen in the Kremlin no one would care. It was as if the entire world of print journalism (television had already been written off) had been reduced to a state of paralysis. The same small number of liberal opposition outlets, including the oft-cited radio station Echo of Moscow, and Novaya Gazeta, which has seen five of its reporters, including Anna Politkovskaya, killed, were allowed to publish pretty much as they pleased. They soldiered on but their impact, by any measure, was marginal. Roman Shleynov, who was then the investigative editor of Novaya Gazeta, told me in 2009 that the greatest obstacle journalists face isn't the state but an indifferent public. And indeed for investigative journalism to thrive it has to be more than just an echo chamber. So, in two years time, has the Russian public suddenly taken an interest in corruption, money laundering, and the rights of the average shareholder? Navalny's success certainly owes something to the historical moment. He began blogging just as Putin's presidency was coming to an end and, more importantly, the extraordinary financial growth and stability of the past decade was beginning to unravel. Today there's a greater appetite for the kind of whistleblowing that Navalny has been able to capitalize on. (This has not been lost on Navalny who recently told the Guardian that, “It's become more fashionable to be in the opposition, because everyone sees that the country is going to hell.”) Navalny has also worked closely with Russian media, including the financial daily Vedomosti and Forbes Russia, for whom he has been a columnist. According to Maxim Trudolyubov, opinion page editor of Vedomosti, the paper's investigative stories frequently serve as source material for Navalny's blog posts. “Very often it is a Vedomosti story that leads to a Navalny blog,” Trudolyubov wrote in an email. In addition, as a blogger, Navalny does not face the same restrictions that traditional media do. “Navalny's success is determined by the fact that he has made use of the Internet and provides enough documentation to support his claims, which makes his information trustworthy. Articles in the press with limited circulation like Novaya Gazeta do not get that much attention and there is no visible feedback,” says Anna Sharogradskaya, director of the Regional Press Institute in St. Petersburg. But Navalny's greatest asset may be the fact that he's not a journalist. The other side of Shleynov's argument is that the public no longer believes in journalists or in newspapers (though, paradoxically, there are still a wide array of dailies). In the public's eye they've become agents of the very same corruption that is now the hallmark of daily life in Russia. Articles are paid for. Editors, and by default, journalists are no better than the scheming businessmen they write about. The public isn't just indifferent but disbelieving. Navalny, though, seems to have broken through. On the one hand his ascent seems to underscore the weakness of traditional media: Why can't Politkovskaya's paper, Novaya Gazeta, get anyone within Russia to take it seriously? On the other hand it points, perhaps, to new possibilities. Journalist or not Navalny faces the same threats — legal and otherwise — that have dogged Russian reporters since the mid 1990s. Last week it was announced that the gunman who shot Politkovksaya in the elevator of her apartment building in Moscow in 2006 had been apprehended. Whether his arrest will shed any light on the case and those who were ultimately behind it remains to be seen. And Politkovskaya's death is only one among many — the most high profile — that has languished in Russian courts for years. As for Navalny, a criminal investigation has been opened against him alleging that he abused his position as an unpaid adviser to a regional governor who made a money losing deal with a timber company. No matter that the governor has come to Navalny's defense; if convicted, he may face up to five years in prison. Many see the case as laughable: trumped up charges designed to silence a rising media and perhaps political star (Navalny recently told Reuters, “I would like to be president but there are no elections in Russia,” and has said publicly that, “Without any doubt, I am striving for power.”). If that sounds familiar, well, the same explanation has often been used to characterize the Khodorkovsky affair. 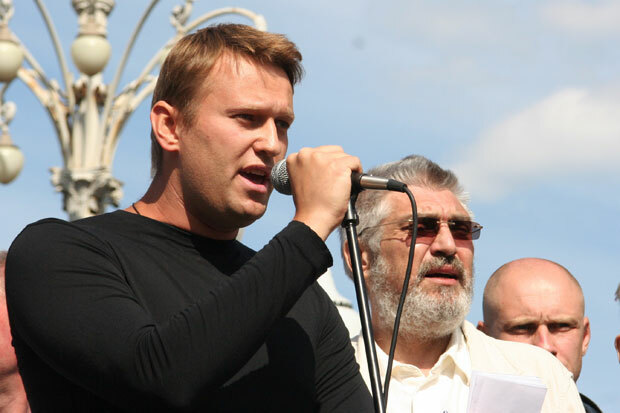 Whatever becomes of Navalny, will his model of citizen journalism survive? According to Julia Ioffe, in a recent profile of Navalny in the New Yorker, “RosPil spreads the risk involved in exposing corruption, and provides a kind of insurance: if anything happens to Navalny, RosPil can continue to function, and may embarrass the government into reforming itself.” But it remains an open question whether RosPil would continue to function — let alone thrive — without Navalny at the helm. And if Navalny's interests are largely political, his impact on Russia's media landscape may be short-lived. For now, though, Navalny is one of Russia's most popular bloggers — his twitter feed has nearly 50,000 followers — and RosPil attracts thousands of visitors every day. In a country where newspaper readership has declined dramatically in recent years that hardly seems insignificant. It may be too soon to measure Navalny's impact but he's clearly tapped into a desire for the kind of investigative reporting that has been so severely muzzled in Russia over the last decade and a half. Blogger, corporate lawyer, or political player, he's proven that there's plenty of room for more sites like RosPil. Editor's Note: This post was updated on June 8.